Visiting the Country of Japan, left all of us longing to speak their language and be able to communicate with them in their culture more directly. Japanese is not considered an easy language to learn as it “borrows” 3 sets of characters from other languages in the region such as the Chinese “Kanji”. For many western travelers looking to visit this island, this may perhaps be the biggest hurdle. We were very fortunate to have the help, guidance and translation from our PRI Japan faculty and staff, who graciously helped us navigate the transit system which is the largest and busiest in the world. Summarizing these 10 days into one page, feels like trying to interpret Japanese all over again. There is no way to accurately relay our deep respect and appreciation for the people we met along the way. Although there was at sometimes an inability to communicate these feelings to one another. They were greatly felt, through the smiles, bows, shared meals, and sightseeing that we accomplished while visiting. We started the trip with the presentation of Cervical Revolution by Ron Hruska, in Tama Center, Tokyo at Teikyo University. Mr. Takahashi, was generous to pick us up and drive us to the course each morning and made the transportation such an ease. The Teikyo University facilities and staff there are some of the most hospitable and friendly group of professionals we have been around, and they love to have FUN! These 3 days provided a deeper discussion on the Secondary PRI concepts relating to the Cervical Spine, and the course attendees were eager to learn. Following the Cervical Revolution Course we had scheduled two question and answer sessions in Tokyo, and Kyoto. The goal of these Q&A sessions was to answer any questions related to PRI that the community in Japan may have had throughout their attendance to Postural Restoration and Myokinematic Restoration. It was a tremendous success and although Sy had prepared several slides of possible topics to discuss, we never relied on their use. The audience was active and the questions (which were translated to Ron) ranged from the foundation of the science of Postural Restoration, to specific course questions and everything in between. The rest of our trip revolved around seeing, experiencing and doing as much as we could in the remaining few days we had. We visited countless Shrines, and Temples and after our stay in Takashi’s home of Kyoto, we headed to Kobe. Kobe captivated us for many reasons but speaking as a Nebraskan from the Great Plains, I think we were all excited to see more of the countryside and less of the underground subway stations. As soon as we arrived in Kobe we started exploring. With only one day there, we knew it was going to be full. The morning started by taking a gondola to the top of the Kobe Herbal Gardens and the view at the top was breath taking. Soon after we were met by Mr. Akira Yoshimoto (who visited Lincoln a few months back, and has become a great friend) and his colleague, who guided the second half of our day. They took us out on a ferry ride through Kobe Bay, followed by dinner and a mountain top view of the skyline. This dinner deserves a blog alone, as the Kobe Beef experience was one I will never forget. No amount of time or words can do justice to the amount of love we received during this trip. Many people deserve recognition for making it a success. Specifically Kenny, Sayuri (Sy), and Takashi as they were our lifeline every day. They are all three living in Japan for the first time in years, as Kenny and Sy, until recently remained in the US. Not only did these three individuals create a once in a lifetime experience for us, but they work tirelessly to further the growth of PRI Japan. They have now translated all three primary courses and continue to host these primary courses throughout the year. We already miss them, and although there is now a few more hours added to their flight time, we are hopeful that we will still see them throughout the year. One of the only words I made sure to learn the first day we arrived was “Thank you”. Arigato Gozaimasu! I knew it would probably be the only word(s) that would matter, and 2 weeks later I wish I had said it ten times more. Thank you to everyone involved with PRI Japan! Thank you to the course attendees who traveled and took off work and asked questions. Thank you to all of the host sites. Thank you to the PRT’s and PRC’s located throughout Japan, and thank you again to our PRI Japan faculty. We look forward to continuously growing with you all. This past week I had the opportunity to lab assist with Pelvis Restoration and have a booth at the Professional Hockey Athletic Trainers (PHATS) Annual Convention. It was a joy talking and meeting so many Athletic Trainers and strength coaches from multiple divisions of professional and college hockey. Your passion and energy was visible in the course, I had so much fun helping out with lab and getting to learn more about hockey and all of you! Midweek last week I enjoyed the opportunity to visit the largest Marriott hotel in the world to teach Pelvis Restoration to a group of engaged professionals at the Professional Hockey Athletic Trainers Society/Society of Professional Hockey Equipment Managers' annual gathering in Orlando, FL. Thank you Anita Ramsay and the Orlando World Center Marriott staff for organizing the event, and to each of what was likely many people involved within the PHATS/SPHEM group for arranging the amenities and host site. In a room filled predominantly with highly trained ATC's and a host of other professional hockey specialties including LMT's, NHL spotters, and strength coaches focused on intervention in the professional hockey realm, the day began with a discussion of how to integrate PRI principles of Pelvis Restoration into practice by discussing how the pubosacral ring is affected by normal asymmetry that often leads to positional dysfunction of a pelvic diaphragm and can potentially decrease athlete's performance. Thank you Todd Daniels and others for spurring a thorough conversation about intervention pre and post competition early in the course to give us a functional application lean throughout. As we moved toward learning eight Pelvis Restoration objective tests that can be used to guide said pre and post competition intervention algorithms to add variability during and after play, course attendees participated in a discussion about Femoroacetabular Impingement (FAI) and how both acetabulofemoral (AF) and femoroacetabular (FA) position and harnessed pelvis movement ability can affect the varying types of FAI. Thank you Brent Woodside for your help with demonstration of how accentuated normal patterned position can affect asymmetrical beings, decrease performance and add risk. Special thanks to Seamus McKelvey for bringing the best Irish name and beard to the course--and congrats to Luis Alvarez for winning the Josh Olinick best hair award for this course. As we moved to treatment, I was impressed by this group's consistent focus during the many lab sessions dealing with objective tests, inhibitory repositioning technique practice and neurofacilitation program technique practice and discussion. Thank you Thomas "quick hands" Alva for your athletic prowess with the pelvis toss and attention to detailed questions about special testing that ensured course participants were able to apply information as quickly as possible in practice. Rockstars: From start to finish, PRC's Connor Ryan and Megan Bollinger and ATC Matt Hornung from straight outa Lincoln were on point during this course, guiding lab groups through a plethora of lab learning opportunities with steak-like Pelvis Restoration course lab material. These three were A+ and integrated seamlessly into and out of lab demonstrations. You three killed it! Many thanks also to Andrew "bowling ball" Sachkiw, Elise "feisty" Nichols, Kristen Larsen, Tyler Stratton, Ryan Lewdon, Steve Ruhmel and more for your willingness to help with lab demonstrations of particular pelvis inlet and outlet inhibition and facilitation techniques and concepts for group learning through the course. Each of you were great! During break times and after the course, I enjoyed the conversations with Emi Takahashi about her applied pelvis hockey research @ WSU, Kyle Moore about how to integrate Pelvis Restoration into practice and multiple others throughout the course about varying, relevant and pelvis restoration specific topics. Thank you Matthew Aiello and others for your varying senses of humor throughout the course, keeping the group light and yet tremendously attentive throughout. I really enjoyed my stint in Orlando applying Pelvis Restoration with all of these fine hockey professionals from around the country! Earlier this month, we hosted our first Non-Manual Techniques Workshop with 42 attendees from across the US, and several different countries gathered in Lincoln to learn more about the intricacies and details of the PRI Non-Manual Techniques developed by Ron Hruska. The first 5 hours or so, Ron spent time discussing key concepts related to positioning, reference centers, and the organization of the Non-Manual Techniques programs. This then allowed us to then dive into several techniques (approximately 15) in great detail, and get Ron's input on set up, performance, cueing, modification, types of patients the technique is good for, and more. For each technique, Ron had an attendee demonstrate, while he provided tips on performance and modification. The workshop was a huge success and based on the feedback from the attendees, it is something we plan to host twice next year in Lincoln. We have had several requests others wanting to host this workshop, however due to nature of how the workshop is organized and run, the set up at the Institute is best, where I can assist Ron in pulling up techniques onto the screens as needed. Another fun thing about this workshop, is other than the first 5 hours, no two workshops will be the same! We thoroughly enjoyed the first go around, and look forward to next year! "I learned better ways of cuing patients (tactile/haptic) and more focus on reference centers to maximize patient ability to improve/progress more effectively and quickly." "Awesome tools to progress or regress routine all within the same exercise!" "Excellent!! Must do after 3 primary courses." We are excited to offer our Manual and Non-Manual Technique Programs directly on our website as Digital Downloads. If you have already purchased the CD's or DVD in the past, there is no difference in content between these and the digital download version, and the process to save these programs to your desktop is the same. But, with ever-changing technology of computers and laptops (many of which no longer come with a CD/DVD drive), the digital download offers a more convenient way to purchase these products. Each of our three primary courses; Myokinematic Restoration, Postural Respiration, and Pelvis Restoration have a corresponding Non-Manual Techniques program. 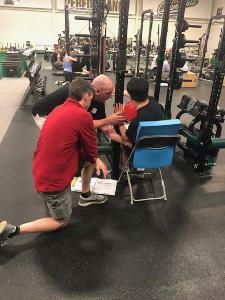 The Manual Techniques program includes nearly two hours of video including demonstration, instruction and explanation of each manual technique provided by Ron Hruska, which compliments the Postural Respiration course. If you are Interested in learning more about these products, they can be found on our website HERE! Northeastern University hosted another wonderful weekend on their beautiful campus in the south end of Boston. Grateful to have such awesome hosts as we were honored to present our secondary level course, Impingement and Instability, to a wonderful group of professionals from several disciplines. Nate Bocko, Michelle Boland, Mike Anderson, Justin Parent, Dan Sanzo and Dan Adamietz, you guys were first class and represented Northeastern Sports Medicine very well. Your support for the science of PRI is appreciated and means a lot. Loved the discussion about athletic training and strength and conditioning application in collegiate athletics. Thank you for your willing participation throughout the weekend. And thank you to Hannes Bartz, a motivated Physiotherapist who traveled all the way from Germany to attend this class. Awesome to have you there with us. As an American, I have never traveled to Europe to participate in continuing education, so I always tip my hat to professionals who make this kind of a commitment to be with us. Thank you for being such an attentive student, listening to and asking really good questions in a second language. Sorry I didn't know more Deutsch. Your candid and honest approach to learning was both refreshing and humorous. It was also really cool to have 4 PRCs in attendance (including myself). Thank you Donna Behr, Anita Furbush and Karen Taylor-Soiles for adding your experience and insights to the course experience. And special thanks to you Donna Behr, for your past presentations to the sports performance staff at Harvard University. Were it not for your mentoring mentality, we may not have had Yumi Kuscher and Andrei Tarsici in attendance from the Athletic Training Staff at Harvard. Where would we be without all of Andrei's great questions? And sorry I kept calling you Andrew for the entire first half of the first day Andrei. Your questions were great. The class established some powerful themes the first day that we were able to maintain throughout both days to help provide more clarity with clinical application. Neurology, frontal plane Lateralization and the management of hemispheric performance during rotational activities. Thank you guys for working with my analogy of getting ticketed on Tropicana and Las Vegas Boulevard when I was a young student at UNLV. For those of you who did not attend the course, I can't say anymore than that. You know what they say about "What happens in Vegas,...". I really loved the comments from so many of you stating that this course really opened up key application principles of PRI, beyond just the basics of the 3 introductory courses. Its great to re-look at all 3 of those courses with a different set of lenses, figuratively and literally. The complexity of PRI really does start to become simple when hemispheric lateralization and the autonomic nervous system are fully respected. Being my first trip to Virginia, I was excited to be able to share the science of PRI to many first-timers. We had a very good mix of strength and conditioning, rehab, and sports medicine professionals in the audience. Virginia Commonwealth University were great hosts for our weekend of exploring how the polyarticular chains influence our every day lives, as well as our sports performance. Many thanks to Eddie Benion and his crew, James, Jason, Ray, Christopher, and John. We spent our first day going through the patterns of the L AIC and R AIC. We discussed how the patterned behavior facilitates some muscles, while inhibits others, on each side of the body. And we had a great discussion about while is it awesome to be Batman, being Bruce Wayne is much more valuable. We talked about "good" Boy Bands, and "bad" Boy Bands. The best part of the weekend, in my opinion was the amount of time we had for lab. We spent nearly half of the day on Sunday in lab, where everyone got a chance to find and feel the muscles that we need to facilitate, and inhibit, if we are to get into L stance and off the R leg properly. My thanks to my lab assistant, Eileen Kokosinski, PT. You were a great help! We were able to go through an inhibition lab as well. And we were able to link the activities back to the Hruska ABDuction and ADDuction Lift tests. My thanks to Sara Creger, DPT, for letting us use her as our lab demonstration model. As well as Drew Coulter, DPT, and James Benzel, ATC, and Jason Castleman, ATC, for allowing us to learn from them as well. As always, we had a great room of learners, and we had a ton of great questions. My thanks to Joshua Jordan, Leanne Dunaway, Scott Burch, Tom Loyd, Ethan Saliba, Edwin Santiago, and Jason Turner. It was so great to hear this mix of health care professionals ask questions, and learn from each other about how human asymmetrical patterns affect our daily lives and sports performance. Agilus Health is seeking a Phyisical Therapist for IMMEDIATE HIRE! Join our rapidly growing Clinic in Alexandria, Louisiana. We are currently looking to quickly hire a Full-Time Licensed Physical Therapist for our Alexandria location. If are a PT who likes to solve problems and have and have a genuine love for seeing people happy because of your ROCKSTAR skills, then you are just what we're looking for! If you found yourself associating all of the above with the Physical Therapist that you are, then we want you ASAP! The spacious auditorium of St. Luke’s Hospital was the weekend home for 44 course attendees. The science of PRI continues to expand its reach to professionals from a variety of disciplines (PT, OT, PA, DC, PTA, ATC, and CSCS), with the lively Marquette University training staff well-represented. This course dives right into discussion of our asymmetric diaphragm, creating lateralized patterns of air flow and obligatory patterns of movement, defined as the L AIC, and R BC. Attendees learned: the correlation between PRI tests and a person’s ventilatory – thus walking – strategy; how to identify joint pathology that can develop when the typical human patterns of the L AIC and R BC go awry; and how to identify pathological breathing strategies that develop from patterned position and activity – namely superior T4 and PEC syndromes. Lab provided a kinesthetic and aural dimension to assessing activity of the left and right AIC, BC, and PEC, the quality of ventilation, and the degree of rib cage pliability/restriction. Our rib cages benefited from manual guidance to fully exhale and expand. 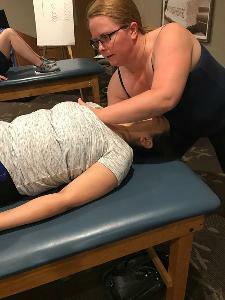 Further lab was devoted to experiencing non-manual techniques that reinforce sensing of opposition muscles that shape the left diaphragm’s ZOA and shift our center of mass to the left while rotating the upper torso back to the right. - Mary Jo Herrick and Selene Wang, DPT, of Aurora Healthcare, for the set-up, break-down, and keeping us hydrated and fed. - Gabe Champeau, DPT, and Anita Panagiotis, MSPT, PRC for assisting during labs and sharing your clinical pearls. James and I were fortunate to have a packed house at our PRI Fitness and Movement course in Burlington, VT. We focused on cleanly delivering principles of breathing as related to optimizing movement health, postural balance, core stability and self-regulation. In this course, we break down breathing and dynamic thoracic posture principles into digestible chucks then link them back to creating dynamic symmetrical balance around the shoulder and hips. Through regulating our breathing and thoracic posture we can reduce unwanted muscle tension and patterns of hyperactivity which can impair various performance relationships. I know I probably say this in every post course review I write– but this course continues to get better each time we teach! The attendees really do make the course and this was a great group! Thank you to all that attended! I continue to get excited for the future of this course and how it can help others learn about the invaluable science of Postural Restoration. Special thanks to our host, Matt Baine and the University of Vermont Athletic Training staff. Awesome space which accommodated great lab time and the staff was superb. Also special thanks to our lab assistant Maura Guyer and the other PRCs that attended – Mike DeMille, Sean Fitzgerald, Oliver Hall, and Chad Rainey - your continual support to help these affiliate courses succeed is greatly appreciated! Lastly, special acknowledgement to our furthest traveling attendee, Massahiro Goto who was a chiropractor that traveled in from Japan to learn with us! What great representation of extraordinary dedication and care to his craft! If you are interested in attending we have four courses left this year and James and I both encourage you to sign up sooner than later as they will get sold out – We will be teaching in the areas of Charlotte, Los Angeles, Chicago and Philadelphia. If you can’t make it this year and are a good host site for next year, we’d love to hear from you as we are starting to look for host sites for 2019! The Cantrell Center for Physical Therapy, Sports Medicine, & Wellness is NOW HIRING! We're proud to have served Middle Georgia and the community at large for over twenty-five years, as an independently owned clinic and wellness facility. We are a collaborative environment, where patient care is paramount and each team member’s gifts and experiences blend to create an atmosphere of integrity and encouragement. As part of our team, you will work side-by-side with like-minded and dedicated colleagues, while enjoying the opportunity to build your own career. Located in Warner Robins, Georgia, the Cantrell Center is positioned in the Middle of the state! Just a quick drive to Atlanta or the beach, Warner Robins offers convenience to any interest without the crime rate and elevated costs of a larger city. Visit the website of the Robins Regional Chamber of Commerce for more information about the city of Warner Robins. Why settle for less than this in your career? For information about the Cantrell Center, please visit us on: Facebook and Instagram.